I have written previously about coming to understand principles of garden design – including the importance of repetition (It’s Good to Repeat Yourself), of scale (Don’t Be Small-Minded), and of paying attention to foliage (It’s Not Just About Flowers) – by learning from my mistakes. But mistakes are not the only way to learn design lessons. 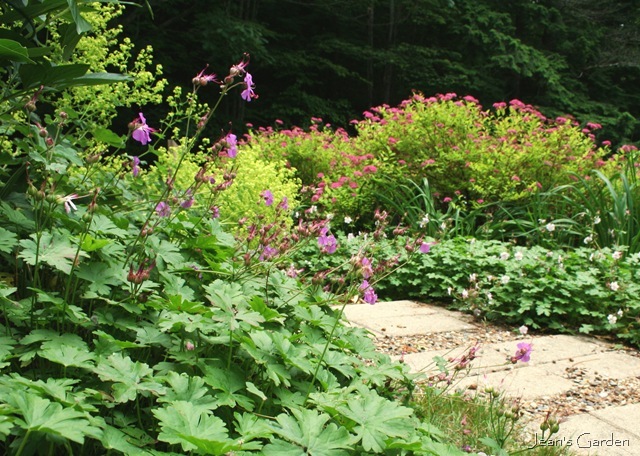 In my experience, the most important element in garden design is serendipity. Serendipity is the capacity to make happy or useful discoveries by chance. Because gardens are dynamic and plants grow and combine in unexpected ways, happy accidents are common in gardening; serendipity in garden design is the ability to discover the principles underlying those happy accidents so that they can be intentionally recreated. 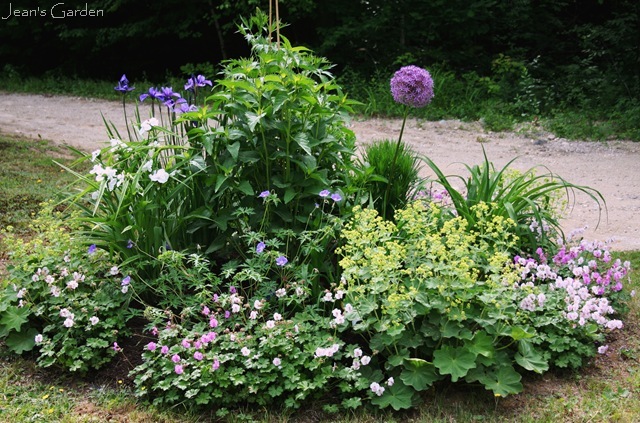 When I designed the planting for the circular bed (above), I was looking for a way to use divisions of Geranium x cantabrigiense ‘Biokovo’ that needed to be thinned from the deck border. But I knew that I wanted more contrast than an outer edge of pale, frothy Biokovo flowers would provide. So I decided to interplant Biokovo with the deeper pink of G. x cantabrigiense ‘Karmina.’ And because I had already discovered (by chance) that the foliage of Alchemilla mollis (lady’s mantle) echoes the shape of the G. x cantabrigiense foliage, I decided to break up the band of Geranium foliage with Alchemilla plants. When this planting bloomed the following June, I was enchanted by the combination of chartreuse and pink. And having learned from this happy accident that these colors are beautiful together, I decided to repeat the same combination of plants in the fence border. The combination of pink geranium and chartreuse lady’s mantle along the front edge of the fence border was as lovely as I expected, but the planting also worked in ways I didn’t anticipate. There were new happy accidents in the way that these plants related to other parts of the back garden. The first of these gifts of chance was the way that the hot pink-chartreuse combination of Geranium ‘Karmina’ and Alchemilla mollis, growing side by side at the south end of the fence border was repeated in the chartreuse foliage and deep pink flowers of Spirea x ‘Magic Carpet’ in the deck border, drawing the eye across the walkway and creating a harmonious link between these two flower beds. I also didn’t anticipate the way that, as you enter the back garden, the frothy chartreuse plumes of Alchemilla at the end of the fence border set up a rhythm with the Alchemilla flowers at the front of the blue and yellow border, moving the eye along the walkway. Although I had previously thought about how to link different flower beds with one another, my efforts had consisted primarily of repeating the same plants in more than one part of the garden. These happy accidents have helped me to a more nuanced and sophisticated understanding of how plantings can be visually connected. These lessons of serendipity will be very helpful in a few years when I begin to design a new front garden. Not all my fortuitous discoveries involve geranium and lady’s mantle. I will end this post with one more example of serendipity, from the blue and yellow border. I have long enjoyed the display of blue created by the simultaneous blooming of Tradescantia ‘Zwannenburg Blue’ and Siberian irises (Iris sibirica) in June, and I have attributed my pleasure in this display to the repetition created by the color of the flowers and the shape of the foliage. This year, I finally realized that there is more going on in this combination; the simple three-petal structure of the tradescantia flowers is echoed in the more complex structure of three falls, three standards, and three styles in the iris flowers, and this similarity of flower structure is as important as flower color and shape of foliage in creating a sense of unity. I think this discovery can help to resolve the tension that many home gardeners experience between expert advice to plant in big drifts and the desire to grow a variety of plants in a limited space. 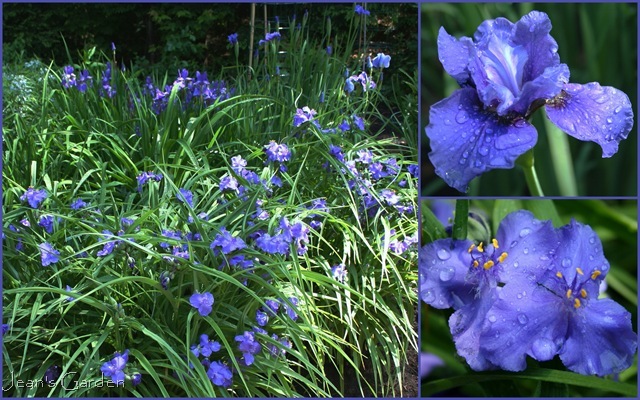 Although there are four different plants in the vignette above (one variety of Tradescantia and three different varieties of Siberian iris), the eye blurs the differences and sees a big drift of similar blue flowers. For me, serendipity is not only a critical element in garden design, it is also at the heart of gardening’s excitement and joy. As long as I am gardening, there will be happy accidents to discover. And as long as I am open to those happy discoveries and the lessons they can teach, I will continue to learn and grow as a gardener. Very well written, Jean. It’s true. 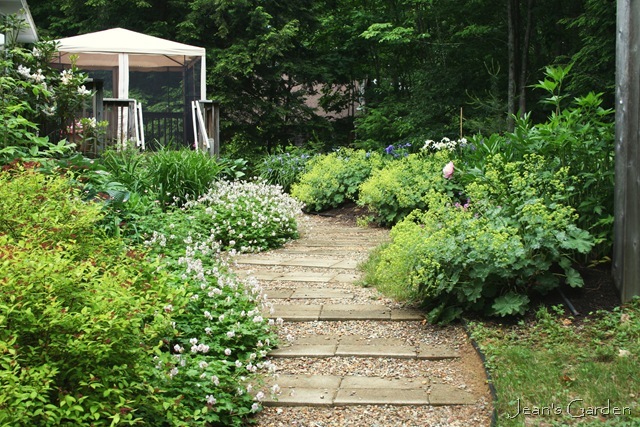 Serendipity really can teach us much about garden design. I love the idea of placing similar plants together to give the illusion of a large drift and the plants you chose to illustrate this principle are so beautiful. Your idea is a good remedy for those of us gardeners [me] who tend towards a hodgepodge “design” because we need to have one of everything. Kudos. Grace, I figured out quite a while ago that I could group together several varieties of the same plant that were in the same color group (e.g., 3 different varieties of blue Siberian irises or 3 different cultivars of yellow daylilies), but this is the first time I realized that I could extend the principle by using a different plant with similar flower structure, color, and foliage. I think this is going to be a useful idea in future garden designs, so I’m glad you found it useful, too. This is all lovely. I wanted to tell you that I agree with what you wrote Carol about politicians. So true and all the worse for our precious planet. I’m enjoying seeing the subtle repetitions working in your garden. It really does give it a nice but subtle structure. I remember reading a story about one of the important early 20th century English garden designers where it was pointed out that the designer didn’t have a lot of money and propagated her own plants from ones she had already. The net effect was that she had a simple garden palette that resisted the business that a garden with too much going on can suffer from. James, In my case, it’s not so much that I can’t afford to buy plants but that I can’t bear to throw away self-sown seedlings and thinned divisions. I’m also a lazy enough gardener to like making use of plants that have already demonstrated that they like to grow in my conditions. I haven’t ended up with a limited palette so much as a core of plants that, as you so nicely put it, provide a subtle structure for other plants that are rarer in my garden. One of the things that you learn in floral design, chartreuse goes with everything. It makes every colour more intense and I do personally love chartreuse and pink. I also think that you can use design principles, without even realising, because it just looks ‘right’. The after, sometimes, waaay after, you realize how very clever you were. Thank you for the email, did you get my reply? I am still working on things…..
Diane, Sorry I didn’t get a chance to respond to your most recent email; I was away at the coast yesterday. I’ll go take a look at your latest post and leave a comment there. The blues and purples are stunning. I just love your plant choices! Thanks, Cathy. I do love all those intense blues in the garden in June. One thing I’ve been discovering is that many blues are more intense when the weather is cool and dry, so I love to go out and photograph those blue flowers on mornings when the temps have gotten down in the low fifties (or even the forties!) overnight. Have you noticed this effect where you are? At some point, I’m going to write a post about it. So true what you say about serendipity, Jean! I think it is the single greatest reward of gardening! And fascinating comments on ‘drifts of mixed plants’! Oh gosh, Clare, something else to consider — perspective and the way that it affects our perception of plant sizes, especially on slopes. I’m sure if I had been consciously planning it, I never would have planted a shrub on my steep slope by the back door that has grown to cover about 1/3 of the entire slope — but it was just the right thing (another happy accident)! I’m beginning to realize why there are so many garden bloggers out there with beautiful gardens who are also artists; they have the advantage of having studied and understanding all these visual effects. I’m more in the stumbling around in the dark and eventually figuring it out school! What I still battle with is blooming season. I think – that would look good together, and forget about WHEN they actually bloom. Our seasons are not clearly and sharply defined like yours. So my garden flies on serendipity, like a magic carpet. That deep blue is luscious! Diana, I love the image of serendipity as a magic carpet. As I mentioned to Cathy (above), I think our cool (downright cold?) nights and mornings here make the blues particularly intense. I enjoy each of your posts as I truly am the amateur gardener. I look forward to the next few years as my Maine gardens mature. Yours are just lovely. Karen, There are only a few things in life as satisfying as watching a garden mature. Sometimes I sit on the deck looking out at the back garden and marvel at the fact that none of it was there 10 years ago! For most of my life, I have not considered myself a creative person (although I longed to be); so knowing that all this beauty was created from my own efforts (with a lot of help from Mother Nature and serendipity) is particularly satisfying. A great post! I, too, have learned from serendipity…probably more than when I designed a bed based on advice or something I read. I find it also very exciting to discover those magical happenings…so much fun. It is almost as if the plants and I are learning and communicating. Allan, I think serendipity is one of those creative processes that is hard to pin down and document. There is that sudden intuitive leap when you suddenly get it! Michelle, I think your comments capture so well the sense of excitement that serendipity brings. Magical is a very good description for the feeling! Serendipity is a word I like. Like magic, I love the spontaneous surprises. Donna, I’ve often envied the creative, intuitive gardeners who can spot plants around and see how they will look together. I am very bad at visualizing things, and my usual deliberative, analytical approach is one way that I try to compensate. The other way is being open to learning from those happy accidents. Autumn Belle, It is a wonderful word, isn’t it? One that makes me smile and, as you say, evokes a sense of magic. Carolyn, I think I might have been inclined to be an excessively tidy, controlling gardener if I hadn’t been influenced early in my gardening career by Jean Moss, an artist/gardener who turned her garden into a somewhat eccentric nursery for a number of years and from whom I bought quite a few plants. Jean combined an artist’s sensibility with the curiosity of a a scientist, and she loved to see what results open pollination and self-sowing would produce. A tip of the old, beat-up gardener’s hat to you. I love the tradescantia + iris combo. Jean, please check the font size now. I totally agree about diagonal lines…I was trying to make that part a different colour, but all the other colours have those lines in them. I would also like to make the ‘visited’ links a lighter colour, but I haven’t been able to change them yet. Thanks so much for your input. I want everyone to be comfortable reading! Diane, It looks good! I think that grey color in the main reading pane is perfect — easier on the eyes, but the photos still pop. If you wanted, you could probably make the font one size smaller and it would still be fine, but it’s also fine as is. You’ve hit on the element in my garden I could not articulate. I just knew certain parts of my garden made me stop and look over and over. They worked, and I couldn’t say why. This post has really helped me crystallize the sense of “yes’ when it is right. I also like the way you frame the basics: Repeat Yourself / Don’t Be Small / Not Just Flowers… I’ve learned all 3 from experience and they really are the basic truths! Serendipity – what a wonderful viewpoint, Jean. Laurrie, It’s taken me a while to learn to trust my instincts, but I’ve come to understand that serendipity is my friend. Shyrlene, LOL. I don’t think I’ll ever get as far as shooting from the hip; that would require a complete personality transplant! Excellent post, and your garden is stunning. I love all the blues! Serendipity is one of the secret pleasures of gardening. Sometimes folks may think I planned with a critical eye, but I know it happened by accident. I learned by chance that purple and orange look great together, especially in our hot summer sun. I would NEVER have tried to do that on purpose, until my garden showed me. Deb, That’s it exactly — secret pleasure. Serendipity is what makes the garden a magical place. And it’s hard to explain this pleasure to people; you just have to experience it. Jean, I read this post several days ago but there was no time to comment. I just wanted to say how much I liked this post. While I have no design knowledge I always manage to learn something by just watching plants grow and taking note of their traits and following my nose so to speak. Serendipity is the perfect word for it. Marguerite, Thanks for coming back to comment. Perhaps what we mean by a “green thumb” is the cultivated ability to learn from the plants and follow their lead. Jean, you really hit the nail on the head. Some of my favorite combinations in the past 30 years of gardening happened because I let nature take her course and left volunteers where Mother planted them. One of the most important lessons a gardener can learn is to work with nature, not against it. Joene, Yes. I suppose growing as a gardener is really the process of learning this lesson more fully and more deeply. I like even the sound of the word serendipity. I love working with hazard, makes life much more interesting and magical! I try it in photography as much as I can and sometimes the finds are a real treat.